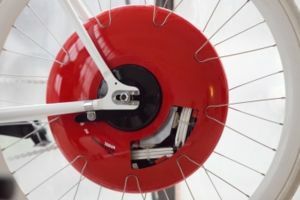 Unveiled Tuesday at the Copenhagen Climate Change Conference, MIT's new Copenhagen wheel is designed to help the environment by making bike riding easier and more enjoyable. The wheel's hub has a battery can store energy as you step on the brakes (regenerative braking) and then return that power back to help you climb a hill or boost your speed. A sensor inside the hub measures your effort when you ride. As you pedal, the sensor tells the wheel's electric motor in the hub to give you a boost. When you brake, the motor turns into a generator, which slows you down and recharges the batteries. This page was last modified 23:43, 15 December 2009. This page has been accessed 4,464 times.